The elusive Snorkel Blue Scuba Hoodie for those of you that have been waiting for images of it. I’d love to know what contrast color is on the inside and on the hood logo. "Grey Unicorn Tears Lively Crewneck Tee and Record Breaker Jacket in Snorkel Blue"
"New Items! 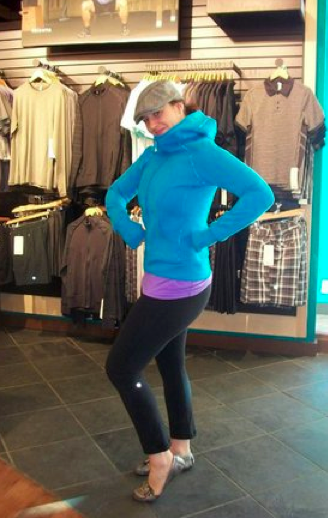 Iris **very violet** Swiftly, Dance Studio Pants in Deep Navy, Wren Lulu Pants and Snorkel Scuba"
What pants are pictured? I love the length!